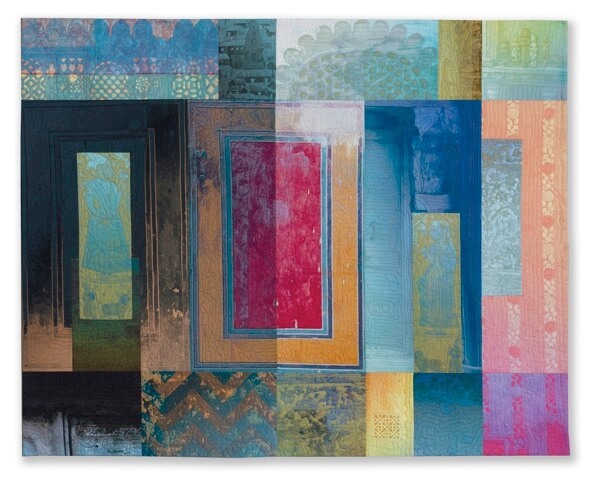 Lincoln textile artist Michael James may have been a newbie traveler to India in 2016, but new work created from that experience shows that he is no ordinary tourist armed with a smart phone. 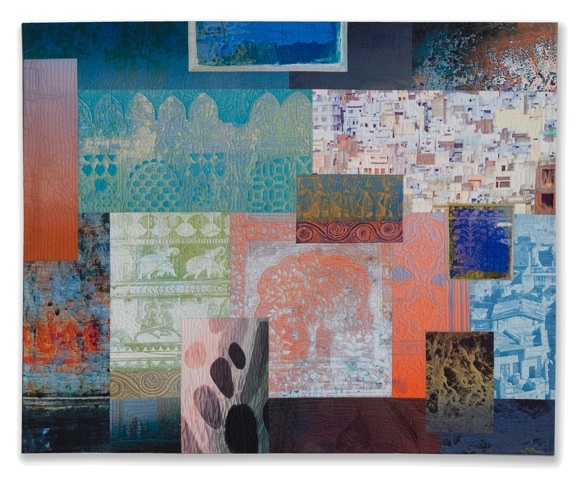 India Through Beginner’s Eyes, which opens Friday, May 4, 6-8 p.m. at Modern Arts Midtown, demonstrates not only his professional touch for mixed media tactile art, but a career-long vision freshly renewed by this journey. True perhaps, but not all first-timers see beyond their selfies. Along with other regional artists such as Steve Joy and Barbara Simcoe, James interprets his travels through his aesthetic making the experience all that more rewarding for artist and viewer. They accomplish this possibly because their “mind” is as open as their eyes to their surroundings. No surprise really as James has had a history of connecting elements in his textiles that at first glance may seem contradictory, especially when influenced by his observation of the built and natural environment. Observer James doesn’t miss much. Artist James makes a tapestry of it all. You can see the results for yourself as you discover India through the “beginner eyes” of an artist who shares more than snapshots on Flickr, Facebook or Photobucket. Michael James lives and maintains his studio in Lincoln, Nebraska, where he is Professor and Department Chair in Textiles, Merchandising & Fashion Design, College of Education and Human Sciences, at the University of Nebraska–Lincoln. India Through Beginner’s Eyes: New Textiles by Michael Jamesopens May 4, from 6-8 p.m. at Modern Arts Midtown, 3615 Dodge St. For more info and gallery hours, go to modernartsmidtown.com or call 402.502.8737. ‘Salon Time’You Spin Me Right Round, Maybe?